You must always align both extruder heads before printing a model with silver. 1. After the alignment has run, there will be two prints on the build plate (see Picture 001) and you will carefully examine the result to be sure that you are getting optimal results, and that alignment has succeeded. Picture 001: Thermoplastic and silver calibration print was output. A.) If alignment was successful, you will receive a touchscreen confirmation status message (see Picture 002). Picture 002: Alignment finished successfully. B.) If alignment fails at any point during its process, then an onscreen error message will notify you (see Picture 003). You will need to re-run the alignment script from the beginning. Picture 003: The silver alignment process has failed. 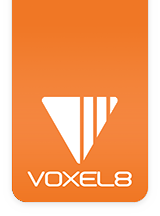 NOTE: The alignment procedure is one of the most sensitive procedure of printing on the Voxel8 Developer’s Kit Printer. If you encounter an alignment fail on your first try, or subsequently, please contact us. Refer to the troubleshooting page if you are having persistent issues, or contact support. 3. Remove all printed alignment parts from the build plate, so you have a clean slate (see Picture 004). You can use the supplied flexible putty knife for this (or your own razor blade). NOTE: When removing the alignment print from the build plate it may still be wet silver. You can either let it dry for a few minutes, or be careful not to smudge the silver. Picture 004: A clean build plate with the alignment prints removed. 4. Hit the back button (see Picture 005) to navigate to the main printing listing screen. Picture 005: Back to the main print listing screen of the touch interface. 5. Now you're ready to print with silver.